WT title: "Sweden's wishful thinking on the Mideast: Naive notions about Iran and 'Palestine' smell like nonsense"
Sweden is arguably the most "European" of European countries by virtue of its historically cohesive nationhood ("one big family"), militaristic and socialist legacies, untrammeled immigration, unmatched political correctness, and a supercilious claim to the status of a "moral superpower." These features also make it perhaps the most alien of European countries to an American conservative. In this context, I offer a summary and paraphrase of my discussion with two senior members of the permanent bureaucracy in the Swedish Ministry of Foreign Affairs (MFA) held during a recent visit to Stockholm. Our affable but pointed discussion focused on the Middle East, on which we agreed on almost nothing; I might as well have been in Sudan's or Syria's MFA. 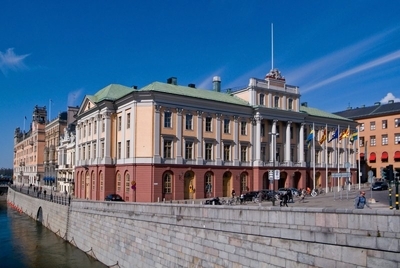 Arvfurstens Palats, an eighteenth century royal palace occupied since 1906 by the Swedish Foreign Ministry. The IAEA inspection regime in Iran is the most intense ever mounted anywhere; it includes cameras that watch the Iranian installations around the clock, so we definitely know what's going on there. My response: How does the Swedish MFA know that those cameras cover every last nuclear installation? In fact, neither Stockholm nor any other capital has any idea what's going on. The Iranians' program could be far more advanced than is known; indeed, Tehran could have even purchased nuclear weapons from North Korea or Pakistan. The Islamic Republic of Iran abandoned its program to build nuclear bombs in 2003. My response: The Iranian government, as its president, Hassan Rouhani himself has indicated, never for a moment stopped its nuclear program. If an outside power attacked the Iranian nuclear sites, this would counterproductively cause Tehran to get really angry and decide to build The Bomb. My response: The notion that striking the installations would inspire the Iranians to proceed is precisely backward. Also, recall that both the Iraqi and Syrian nuclear programs collapsed after being struck by Israeli jets. 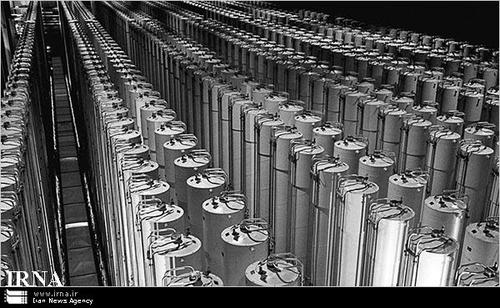 Iran's centrifuges, as shown by the government news agency. This move is aimed, I was told, not to punish Israel but to give heart to those Palestinians despairing of the two-state solution, consisting of an Israel next to a Palestine. As such, it is not hostile to Israel (where government and population back the two-state solution) but hostile to Hamas (which rejects this outcome). My response: The Israeli government and population reacted very negatively to the Swedish decision and will, no doubt, be annoyed to learn that it was patronizingly intended for their own good. Conversely, Hamas has hailed this move and called on other governments to follow Stockholm, in order to isolate Israel. Israeli "settlements" on the West Bank (which I prefer to call "towns") render impossible the two-state solution, making it urgently imperative to prevent their further expansion. My response: I flip this around and see Israeli building as constructive pressure on the Palestinians to get serious about ending the conflict. The longer Palestinians procrastinate, the less land remains. The many statements and posters in which Fatah endorses "car jihad" are unimportant because Fatah is not the official Palestinian "government." So, the Swedish MFA does not concern itself with this homicidal incitement. My response: Fatah, the PLO, and the Palestinian Authority are three names for the same entity. Making a legalistic distinction among them permits Mahmoud Abbas, the head of all three, to get away with murder. 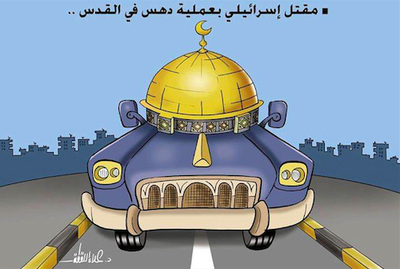 Fatah endorsed Palestinian car jihad in a cartoon showing a Dome-of-the Rock-like car and the words "The killing of Israelis by running-over operations in Jerusalem." The demand that Palestinians recognize Israel as a Jewish state is a trap for Abbas, who cannot do so because of the many Arabs living within Israel. My response: Not to accept Israel as the Jewish state means rejecting the entire Zionist enterprise. Nor is this demand a trap; rather, it responds to changes on the Israeli Arab side in 2006. Why else would Ehud Olmert, then Israel's prime minister – who displayed a Swedish-like fervor for an accord with Abbas – have initiated this demand? This complete disagreement on facts, interpretations, and predictions points to an enormous and ever-widening gap between countries and governments founded on like values. At a time when the ranks of enemies are proliferating, that those who should be realistic and friendly prefer instead fumes of fantasy leaves me discouraged about the future of Europe. What disaster will it take to awaken the Swedes -- starting with their estimable foreign policy functionaries? Mar. 15, 2015 update: For where this foreign policy mindset has taken Sweden, see Ingrid Carlqvist and Lars Hedegaard, "Sweden's Middle East Policy in Ruins," from the Gatestone Institute.